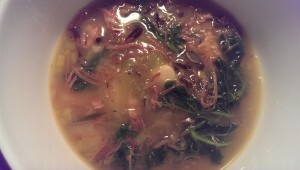 Julie Gracie created this wonderful soup after her spring gobbler hunt. This soup has lots of amazing flavor and makes the best use of kale, parsnips and wild rice. A delicious wild turkey kale wild rice soup! A wonderful soup for your spring gobbler. Make a gallon of turkey stock with the turkey legs and thighs, bay leaves, and onions, 3 stalks of celery, and salt and pepper. When it’s done, pull out the bones and tendons, the celery, and the bay leaves. Set aside. If you only have one turkey, you can amend with the optional chicken stock as needed. Cook the wild rice in a rice cooker. While it’s cooking, start the soup as follows. Chop the remaining 3 stalks of celery, and the parsnips, leeks, and fennel bulb. Parsnips are tough, so make sure the pieces are small so they will cook more rapidly. Heat a small amount of olive oil in a large soup pot over low heat. Add the parsnips and sweat until they turn translucent. Add the rosemary and thyme. Then add the leeks, celery, and fennel - and sweat those until translucent also. Add more olive oil as necessary and stir frequently so that the veggies do not brown or stick. Add the stock and turkey meat to the pot. Bring to a boil and let simmer. When the rice is done, add it to the pot. Add the mushrooms. If you need more meat, add the smoked turkey breast now. When the mushrooms look done, add the Kale and sherry. When the Kale has wilted, it’s ready! Right before serving, stir in a little heavy cream if you like. Completely optional!